Having a plant-based lifestyle does not need to be complex. It is about common sense. I’ve created a simple guide to help you think about plant-based eating. It’s not a definitive guide—these are my personal ideas on plant-based foods. You can print this out and stick it on your wall. It will print to any size—it’s designed to print at A3. 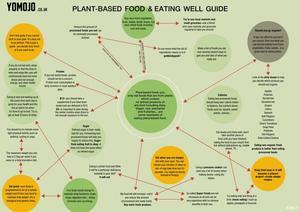 Download your free guide: Plant Based Food & Eating Well Guide. I’m not going to ask you to sign up to anything or ask you for your email. This is completely free. A philosophy and way of living which seeks to exclude—as far as is possible and practicable—all forms of exploitation of, and cruelty to, animals for food, clothing or any other purpose. The important part is; to exclude-as far as is possible and practicable. There are enough wars and hatred going in this world. Let’s not do this with Veganism, or be embarrassed about it. There will be people on both sides who will see it differently. Decide for yourself how much you can do. If you want more inspiration, take a look at the Interviews of people, from all walks of life, that have switched to a plant-based life. It was easy for me because I had over a decade to prepare for it. You can read more about my plant-based journey. Thinking about eating organic food?